Take your bass tone to the next level. 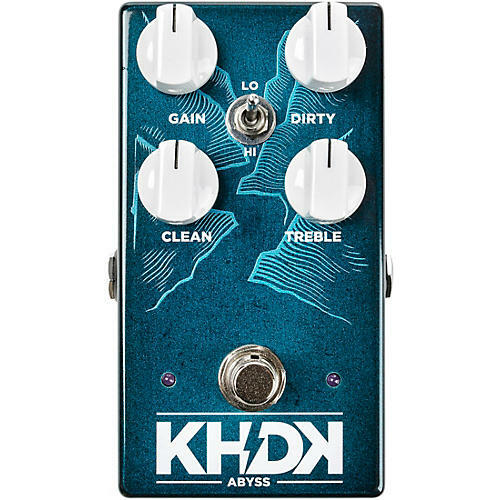 The KHDK Abyss Overdrive is a game-changing bass overdrive, offering bass players complete control over their tone by doing the job of two amps: instead of having to use a clean bass amplifier for fat bottom end and cranked amp for overdriven midrange tone, you can achieve the signature bass rock tone with a single pedal. Abyss adds a full-body punch without modifying your original tone and the Dirty and Clean channels allow you to draft your desired sound with just the right amount of richness added. Utilizing bi-amp technology with two discrete circuits, Abyss Overdrive divides your signal down two paths. One of them stores your original dynamic and color, keeping it unmodified. The other path adds an overdriven sound with fullness and a punch like the KHDK's celebrated No. 1 Overdrive. As the two signals meet again, the result is your original sound made more powerful, fuller and richer. Like all KHDK pedals, Abyss is proudly crafted and quality-tested in Kentucky, USA. Dirty controls the amount of distorted signal in your tone. Clean controls your original sound and adds only volume, changing nothing. Lo/Hi is tied directly into the gain. The lo setting offers a warm, tube-like boost and a subtle crunchy overdrive, great for rhythm playing. The hi setting adds saturation, sustain, low end and compression. This setting is recommended for a more powerful rhythm or soloing. Gain sets preamp gain, affects amount of compression and sustain.